A man has died after he was involved in a collision with a van outside West Midlands Safari Park. The A456 is closed in both directions between B4190 Kidderminster Road and B4549 Sutton Park Road due to a 500-year-old fallen tree. It fell just outside the West Midlands Safari Park. Police say the road is expected to remain closed throughout today and possibly into rush hour tomorrow morning. "The animal's increasingly agitated state and the fact it was found in a densely populated residential area gave officers no choice." Bewdley Museum and the Jubilee Gardens will be hosting free live music this weekend to celebrate the town’s harvest festival. Saturday’s line-up features local folk musicians Bethan and the Morgans. Duck houses, decorated by community groups and businesses will be on show in the Jubilee Gardens. The displays will last throughout the month and visitors can vote for their favourite duck house. Activities for the children include an apple hunt and arts and crafts. Baby white rhino, Ekozu, has been busy meeting some of West Midland Safari Park’s larger and very inquisitive inhabitants. 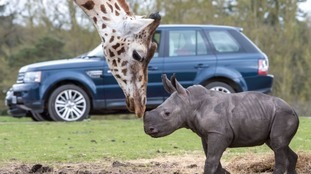 Now at two months old, both mum and baby have been exploring every corner of the African section of the four-mile drive-through safari in Worcestershire. Naturally, this meant bumping into a variety of very curious animals. This included a female giraffe, Faida, and Congo buffalo. As you can tell, he seemed to enjoy himself! A teenage pedestrian has been critically injured after being hit by a car. The collision happened near West Midlands Safari Park at Seven Hills near Bewdley, at just before 6pm yesterday. When paramedics arrived, they found a 16-year-old boy with very serious injuries. After treatment at the scene, he was initially taken to Worcestershire Royal Hospital. A doctor from the Midlands Air Ambulance rendezvoused with the crew en-route. After further treatment at hospital, he was transferred to the major trauma centre at the Queen Elizabeth Hospital Birmingham with the MERIT trauma doctor travelling with the crew. On arrival, his condition was ‘critical’. The car driver was uninjured, but badly shaken. A woman in her 60s was trapped in her car for an hour and twenty minutes after a car crash in Worcestershire last night. Four people were involved in the smash, which happened on the A442 Bridgnorth Road in Bewdley at 9.25pm. Two patients were treated for minor injuries and a 25-year-old woman was taken to hospital. The woman in her 60s was cut free by firefighters before being taken to hospital by ambulance. Police in Bewdley are searching for a 73-year-old woman with Alzheimer's, who is missing from her home. Mary O'Connor was reported missing at 3.20pm today, and is believed to be on foot in the area. She is Irish, described as white, about 5ft tall, and was last seen wearing a beige coat, purple gillet, green jumper and blue trousers, with silver shoes. Because of her Alzheimer's she may appear confused. The baby elephant does not yet have a name and is the first to be born at West Midlands Safari Park in its 41-year history. Court hears "attacker's intention had been to kill."